T-boss was on Thursday crowned the new head of house in the ongoing Big Brother Naija reality show after not winning any task while in the house. His fellow housemate Marvis crowned T-boss according to Big Brother's instructions. 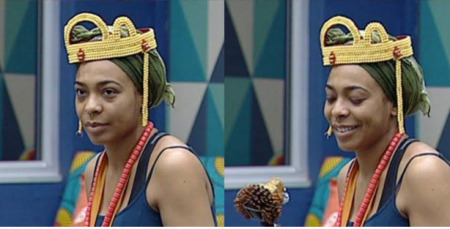 Biggie had said all the housemates will take turns to wear the crown this week. This is coming a day after T-boss got into a fight with fellow housemate, Debie-Rise over her inability to sing the National Anthem during a truth or dare game on Wednesday night. T-Boss, however , realized her mistake and has since apologized to Debbie-Rise, saying, “You know you are my best friend here right?” while hugging Debbie. Debbie-Rise was the first housemate to benefit from the crown rotation when she was chosen as head of house by Bisola on Tuesday.